Suspect sought in shooting along the 5000 block of North Fifth Street on Friday, March 24, 2017. 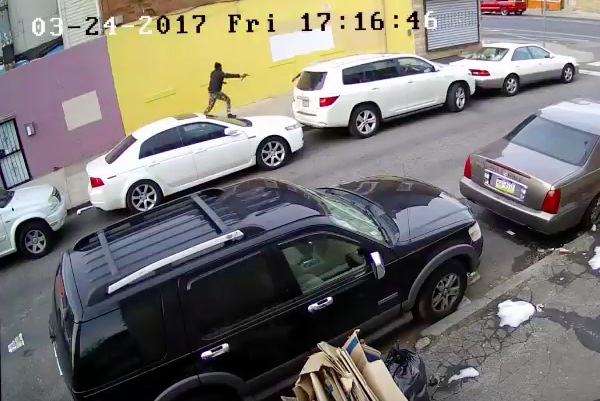 Philadelphia police are searching for a suspect accused of chasing down a victim last Friday and shooting him multiple times in the torso before leaving the man in the street and running off in broad daylight. Authorities said the incident occurred around 6:20 p.m. on March 24 in the 5000 block of North Fifth Street in the Olney section of the city. Responding officers found the victim, a 30-year-old man, with multiple gunshot wounds. He was transported to Einstein Medical Center, where he was treated for his injuries. Surveillance video shows the suspect approach the victim from Ruscomb Street, charge at him and shoot him from behind with a silver-colored semi-automatic handgun, according to authorities. The suspect then fled and was last seen on the 400 block of Ruscomb Street. Police described the suspect as a black man between 20 and 30 years old, with a light beard and medium build. He was last seen wearing a dark-colored knit ski hat, dark-colored coat with a white logo on the left chest, camouflage pants and dark-colored boots. Anyone with information is asked to contact Northwest Detectives at 215-686-3353.